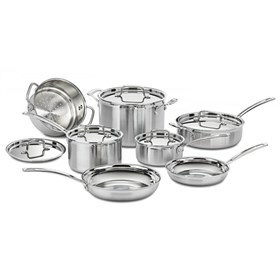 The Cuisinart MCP-12N is a multiclad pro stainless steel 12- piece cookware set to decorate the kitchen. The Product has stainless cooking surface which does not react with food or alter flavors and also has heat surround technology that provides consistent, even heat distribution along the base and side walls of cookware. The The MCP-12N comes with riveted stainless steel handle that stays cool on the stovetop. 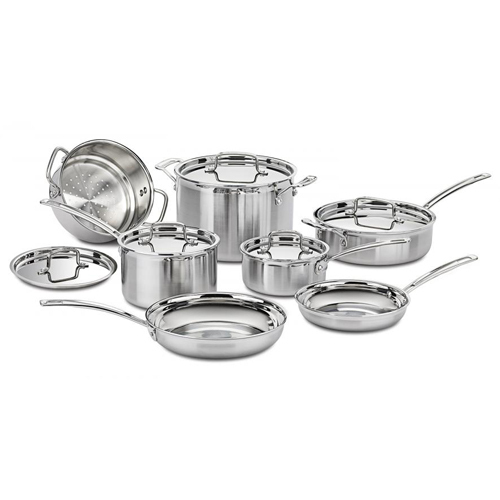 This cookware is ideal for performing small or large cooking tasks. The Multiclad Pro Triple Ply Stainless 12 Pc Set has many exciting features for users of all types. You can extend the lifetime of your Multiclad Pro Triple Ply Stainless 12 Pc Set with the purchase of a FactoryOutletStore Factory Protection Plan. See the Multiclad Pro Triple Ply Stainless 12 Pc Set gallery images above for more product views. The Multiclad Pro Triple Ply Stainless 12 Pc Set is sold as a Brand New Unopened Item.